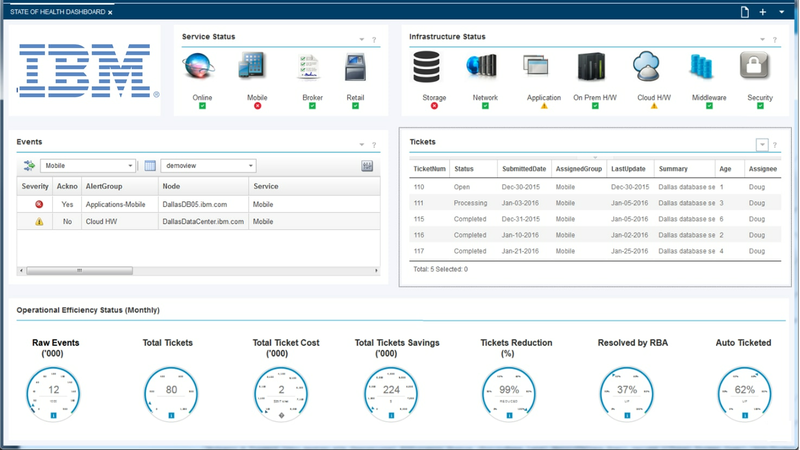 IBM® Netcool® Operations Insight allows you to see network event, topology, availability, performance and configuration data in a single view. You can view network availability status, worst-case key performance indicators, in-context events and configuration change details with the segment event counts and recent configuration history. You can view segments by region, network service or customer—each segment is visible without user intervention. This software helps to consolidate alerts across local, cloud and hybrid environments into a small number of actionable problems. It applies analytics to evaluate historical events to drive efficiency in operations, and identifies problems faster with richer context. IBM Netcool Operations Insight provides end-to-end high performance and availability to meet client demands. You can see the overall health of each of the key applications associated with the IT infrastructure and more easily drill down to the most critical events. Analytics can assist in focusing on the true problems at hand throughout the network and infrastructure. This software uses event analytics to reveal event patterns and recurring problems with similar characteristics, allowing for faster resolution and potential automation for more efficient handling of future incidents. It can increase service availability with early detection and shortened mean time to repair (MTTR). This software can help you gain business-level event enrichment and contextual correlation to further unify disparate systems. IBM Netcool Operations Insight Agile Service Manager helps companies manage the lifecycle of applications and services deployed across highly distributed and increasingly complex hybrid networks. It provides real-time insight and tracking of service and infrastructure changes as well as rich operational context to resolve operational problems more effectively. IBM Netcool Operations Insight is available to run on IBM Cloud Private for rapid deployment and efficient lifecycle management. Please refer to the plan and install documentation at this link. There are no hardware requirements for IBM Netcool Operations Insight.